As nanoscale research continues to advance, scientists and engineers are developing new applications for many different disciplines, including environmental remediation and energy optimization. Nanotechnology Applications for Improvements in Energy Efficiency and Environmental Management combines up-to-date research findings and relevant theoretical frameworks on the subject of micro-scale technologies being used to promote environmental sustainability. 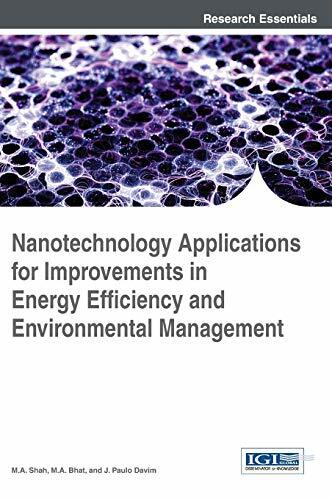 Highlighting the impacts this technology has on energy production and remediation, this book is an all-inclusive reference source for professionals and researchers interested in understanding the multi-disciplinary applications of nanotechnology and nanoscience. M.A. Shah received his doctorate in Condensed Matter Physics from Jamia Millia Islamia (Central University), New Delhi and graduate from University of Kashmir, joined National Institute of Technology, Srinagar in September 1999 as an Assistant Professor in Physics. Dr. Shah is an author of five books published by internationally reputed publishers. He has more than 50 articles and 100s of conference proceedings in the field of Materials Science. He is actively engaged as reviewer and editor of many scientific journals. Shah is also honoured as a visiting scientist in many prestigious institutions and has worked with the eminent personalities of the world at various places, where he pioneered the fabrication of nanomaterials and received trainings for operation of sophisticated equipments. He has explored versatile technique Safe way to Nanotechnology for the synthesis of oxide nanomaterials, though still in progress and practice. Dr. shah is a member of many science academies and societies and his work has been cited by number of scientific reporters as well as scientific media. M. Amin Bhat graduated from the University of Kashmir, Jammu And Kashmir, India, completed his Masters in Biomedical Sciences from Bundalkhand University Jhansi, U.P and is Pursuing a Ph.D in Nanobiotechnology under the joint supervision of Dr. B. K. Nayak and Dr. Anima Nanda.His PhD mainly focused on Molecular assay behind the Biosynthesis of noble metal nanoparticles and their biomedical application. He has been able to publish his research work in various esteemed international journals and participated and presented research articles in National (7) and International conferences (4) organized at the University level. His current research interests include Nanomedicine, Ag-Protein interactions, Ag-DNA interactions, isolation of AgNPs. Working as Teaching and Research Assistant has well equipped him with Technical specialties in microbiological techniques and various molecular biology work related from bacteria and fungi and a basic knowledge on the equipments used for nano based work.